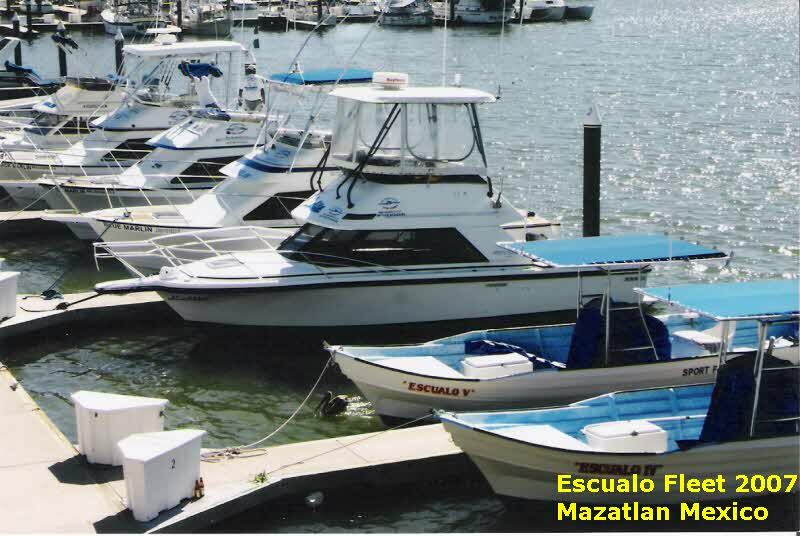 Mazatlan Fishing Escualo Fleet for deep sea and bottom sea sportfishing. And remember, we support Catch and Release!!!. Mazatlan fishing at Escualo Fleet. The Official fleet for Hotel Playa Mazatlan, Pueblo Bonito, Emerald Bay, Torres Mazatlan, Mayan Sea Garden, Inn at Mazatlan. Satisfaction guaranteed, we deliver what we promise or the refund of your money ! We provide a cooler with ice for your drinks and meals. You can bring your own. Drinks can be purchased at the dock ($1 USD forsodas, bottled water & beer), box lunch is $7 USD contains 2 ham & cheese sanwiches, a banana, an orange, an apple, 2 boiled eggs, potatoe chips and cookies. They have to be ordered in advance. All reservations requires and advance payment of $95 for the cruisers or $55 for the superpangas. The balance we suggest to pay it in cash or traveler checks to avoid delays and surcharges with credit card payments when taking the charter. Fishing licenses are $12 per line and have to be paid to the port authority before boarding. , with your reservation number (no fee to change reservation with 7 days in advance-- $40 to cancel, no refunds for no shows). All changes and cancellations must be put in writing via e-mail. Please no phone calls.